Farmer Ambar Rai unloads tomatoes in Jhapa district. ILAM, July 14: A bulk of Nepal's vegetable exports via Kakarbhitta border point in eastern Nepal used to be tomatoes until the past fiscal year. 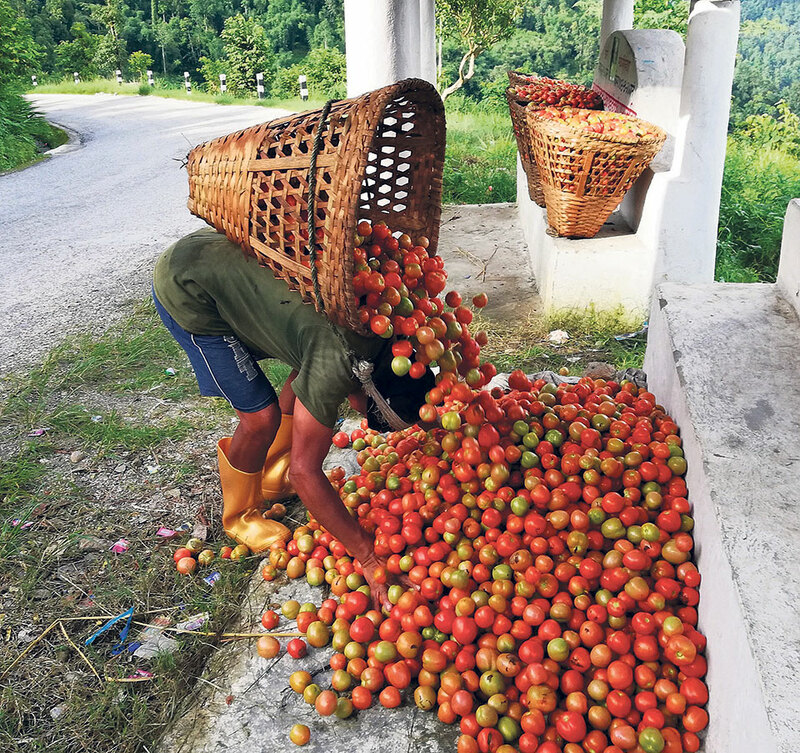 However, with India stopping import of Nepali tomatoes, hundreds of farmers from Ilam district fear that their production this year will simply go waste with no one to purchase them. The Indian Customs Office, which time and time again finds one excuse or the other to hinder export of Nepali agriculture products to India, has obstructed export of tomatoes this time. It has been a fortnight since Indian officials have stopped export of tomatoes from Nepal's eastern Panitanki border. With Indian tomatoes being popular among residents of Jhapa and Terai belt and with exports to India halted, tomato farmers and traders from the region have been at a receiving end. According to traders from Jhapa, a single trader used to export up to 50 vehicles full of tomatoes until last year. Besides tomatoes, chayote (iskus) export from Nepal has also come to a standstill this year. Trader Bijaya Chaudhari told Republica: “Now the tomato farms in the district have turned red with ripe tomatoes. But the Indian customs officers have refused to let Nepali tomatoes and chayote enter India at any cost.” He added. Ambar Rai, a tomato farmer in Kolbung of Rong Rural Municipality -- 4, told Republica that he had purchased 2,000 saplings of tomato plants each for Rs 200 this year due to a good profit tomatoes had fetched him last year. “I have invested double of what I did last year. Traders used to come to our farm to purchase tomatoes for up to Rs 40 per kg last year. However, traders have not come this year. This year, I have hardly been able to sell it for Rs 10 per kg,” he said. Altogether, farmers in Ilam used to make between Rs 800,000 and Rs 1.2 million per year by selling tomatoes and chayote in previous years. But the status quo this year has been a matter of great shock to farmers. Another farmer, Pankaj Dhakal stated: “I am not the only sufferer. There are many farmers having 1,000 to 1,500 tomato plants each. They are at the risk of losing hundreds of thousands.” He added that the government must sit with Indian officials to negotiate in order to resolve this issue. Most farmers share common opinion that due to export dependency on India, Nepali farmers have had to risk their investments time and again. Leela Devi Bhattarai, another farmer, urged the government to create a clear trade system with India. “The country itself has many areas where food supply is inadequate. The government must create a mechanism through which farmers can supply their products within parts of Nepal where there is need. This way, at least the farmers’ investment will not go in vain,” She said. President of Ilam Chamber of Commerce and Industries, Ananda Kattel, stated that despite dozens of talks with the Consular General of India to ease the situation of trade between Nepal and India via Kakadbhitta, the problem has escalated even more. 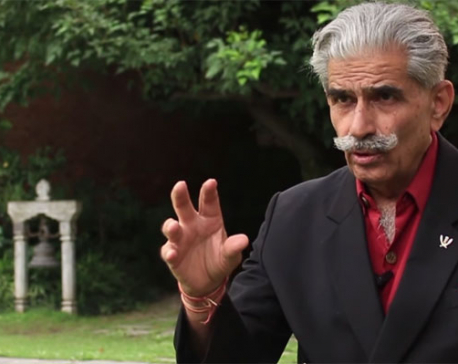 According to him, farmers and traders will continue to suffer until there was a clear framework to govern trade and export between the two nations.